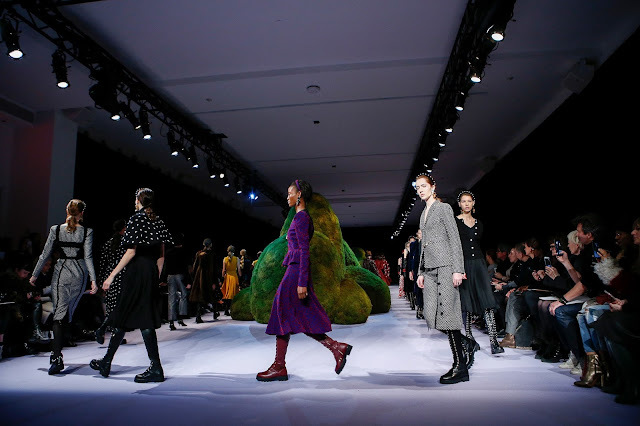 Maybe it’s disinterest, some may call it being misinformed—but I didn’t realise the lack of lynchpin fashion shows at New York Fashion Week this season. Rodarte, a personal favourite, is defecting to Paris beginning with the couture season this summer; Proenza Schouler (who present their last collection at NYFW on Monday) and Lacoste (who presented their last on Saturday morning) will follow suit with a similar decampment. Tom Ford, Rachel Comey, Rebecca Minkoff and Tommy Hilfiger are all looking to Los Angeles, a burgeoning fashion capital. There are still some good shows left. Raf Simons’ Calvin Klein and Marc Jacobs bracket the week’s proceedings. Alexander Wang and Yeezy remain. Sunday, yesterday, featured a number of shows important to the New York schedule. Victoria Beckham arrived on the schedule in 2009 when her fashion design credibility hadn’t yet been established. Eight years later and she’s one of the most sought after high fashion brands in the city, with an impressive annual turnover and a store in London. Her time slot Sunday morning has effectively been hers for years. She generally shows on Wall Street; Anna Wintour will be perched next to Beckham’s husband, the ex-footballer, David and an assortment—if not all—of their children. The clothes are always intriguing. When she began her line was dominated by figure-hugging dresses that reflected her style at the time. 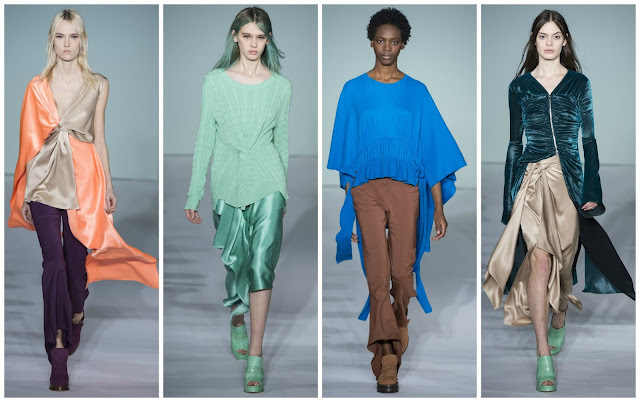 Nowadays, the silhouette is looser, there’s an emphasis on drapery, she’s cultivated a neat catalogue of trousers and her fabric experimentation is second to none. Beckham has distinguished herself from the likes of Kanye West, Kendall and Kylie Jenner, Lauren Conrad, Nicole Richie and Rachel Zoe, who succumb to the celebrity designer shadow. She may well be a public figure but she is an established designer, first and foremost, in the same way the Olsen twins are at The Row. Her Fall 2017 collection drew on a theme that underscored many of the menswear shows this past month: the American Psycho banker. How she diverged from the gawkily masculine air that permeated the menswear was with swishy femininity and dedicate drapery. There was a great, oversized tuxedo with loose trousers and a sheer blouse and a black turtleneck with an abstract print skirt. You could imagine Beckham herself wearing the pieces as always. Building a brand around your personal style and documenting its development—that’s a rare form of success. Directly after Victoria Beckham was the Dao-Yi Chao and Maxwell Osborne’s return to the official schedule after a season away. They repositioned their show to June and January, consolidating menswear and womenswear, to allow for a longer retail lifespan. They weren’t able to generate the publicity they had hoped and the collection itself was unspectacular, forgettable; the press and buyer presence was minimal, seeing as it was mostly domestic industry members in attendance. Switching back to their usual time slot is an intelligent move. On a sparser New York schedule, it even grants them more spotlight. This return to the schedule was proof that their seasonal shift was unsuccessful. Ironically, printed on the back of a sweatshirt was “We Need Leaders”. The duo attempted to signal change with their abandonment of the fashion schedule but that ended in them returning in less than a year. They tasked themselves with rethinking the streetwear codes. They opened the show with an asymmetric mini-dress and sleepless jacket printed with pink and olive foliage. The intrigue in the look fell upon the red had crowning the model, reading “Make America New York”. The scarlet hue… the text… It was, of course, a play on the ‘Make America Great Again’ hats that Donald Trump sold during his campaign. The statement pointed to making the country a liberal one, like New York, where you a met with different skin colours, genders, religions, sexualities and political ideologies mostly on the same side of the spectrum. One couldn’t help but think that this pithy typography was just an opportunity for an Instagram moment and not a genuine political statement. As with Chromat on Friday afternoon, Chao and Osborne toyed with ideas of protection. 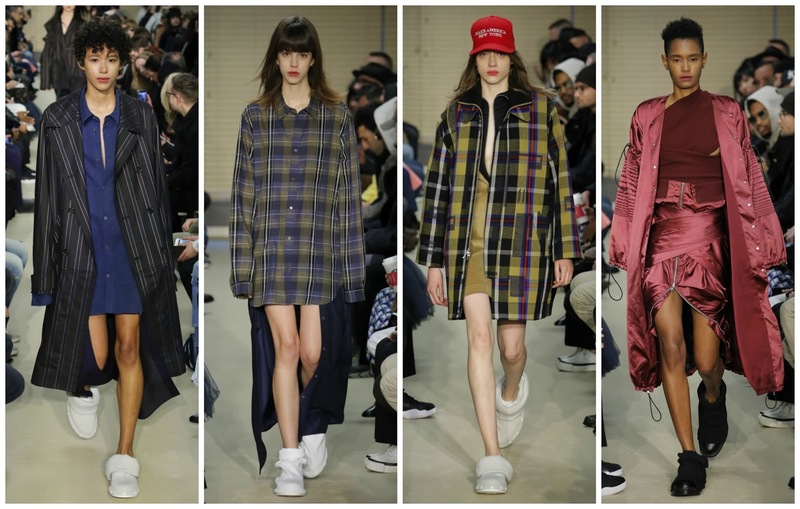 There were large puffer jackets (the styling of some reminded one of Miu Miu Fall 2013) and sturdy, plaid anoraks deconstructed and reformed. Also like Chromat, they used a palette including army green to instil a militaristic mood. Those khaki green culottes are destined for bestselling status. Commercially they are performing sufficiently; there is a store opening in the future—the press flame isn’t burning as brightly as it used to. They were the freshest faces on the New York scene when they first broached the industry. Now, however, they are met with a dilemma: they adapt to the frenetic fashion climate or they will be ‘just another label’. Sander Lak in three seasons has done what many designers have taken years to do: he's built a solid, emerging label, captured the attention of the fashion press, and garnered the support of global buyers, all within in a year. 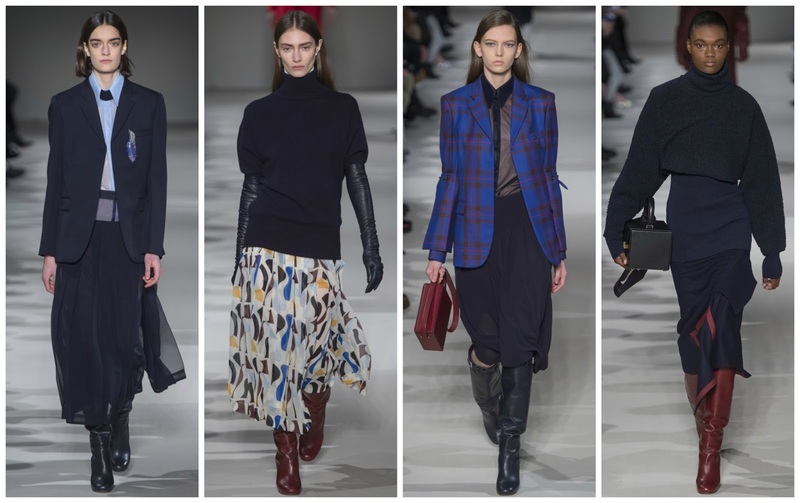 The Dries van Noten-trained Belgian designer has amassed an discerning eye for texture and colour. Van Noten's textural mastery is second-to-none and he has lent his expertise to Lak's nascent operation. There is a sort of nervous energy to Sies Marjan, an effervescence that's endearing and intoxicating. It's compelling, and frustrating sometimes--often the energy is uncontainable and an outstanding moment is narrowly escaped. Mostly, his coloration is thrilling. For his debt he focused on pastel hues and for his sophomore outing he explored fruity hues in lime and raspberry. This season marked an expedition into a treasure box, complete with rich jewel tones: sapphire, amethyst, ruby, emerald, amongst others. The timing of the collection and its bubbly colours—although it will come off as facile—is what we need. As much as there is necessity for political statements, defiance and resistance of harmful regimes and doctrines, a slightly unconfident show bursting with colour and energy is needed. This sentiment cannot be extended to most shows but the clothes at Sies Marjan are—expectedly—fantastic. There was excellent drapery on Harleth Kuusik's coffee and peach cape top, and the exquisite seafoam look consisting of a silk skirt with a cascading ruffle and ruched sweater was impactful and punchy but wholly approachable. Perhaps it's the skittish vitality that accounts for this approachability? Joseph Altuzarra auctioned seats to the public for his Fall 2017 show. This wasn’t a vanity project—the money would be going towards Planned Parenthood, a nonprofit that provides reproductive health services in the United States. Throughout the election cycle it faced many threats to its funding, but the Obama administration banned US states from withholding federal family-planning funds from health clinics that give abortions. Planned Parenthood’s effect on this fashion week has been felt: Anna Wintour, editor-in-chief of American Vogue, arguably the most powerful person in American fashion, wore a Planned Parenthood pin at the Brock show the other day. That same show had pins on each seat for guests to raise awareness. The collection itself was political, but not questionably. It didn’t pursue the logo t-shirt route as many others and it didn’t directly castigate the president. Instead, the impassioned designer celebrated women—he always does, but this season ushered in an emphasis on toughness and defiance. He was inspired by the anti-heroine of Shakespeare’s Macbeth, the titular character’s wife Lady Macbeth, who is arguably the driving force in her husband’s descent into tyranny and encourages his despot rule. Along the way, she questions his manliness and many critics believe engaged in witchcraft. How did Altuzarra transpose the 1600s to 2016? The same way he would any other epoch. With his effortless, recognisable shapes and cuts, he built the Altuzarra wardrobe the way he would if this collection had been about a 80s film. There was his sensual suiting, this time in crimson and steel. Gilded dresses evoked the era, assisted by the pearl embroidery. Elizabethan shirting and coats appeared, with dense fur colours and intricately detailed lattice work. Each look was styled with black boots, conveying a tough, embittered attitude. There was strength here—it was Altuzarra’s best collection. You felt his passion and drive in ways never before seen. That’s how the industry should respond during political crises like these. They can do what most do best already: portray powerful and empowered women in a time when there are threats to women’s rights. Alternatively, they could replace a pithy slogan or a condemning logo across a t-shirt, the industry should instead be auctioning tickets to shows, donating proceeds to worthy organisations that can lobby government groups or change lives of those who need it most, in the case of Planned Parenthood. The Sunday shows in New York complete: food for thought.